Chaîne des Puys - Limagne fault tectonic arena shows a number of geological features caused by a continental break-up. It is a ca. 40km long part of the West European Rift. The site was also important in the study of classical geological processes. The name of the range comes from a French term, puy, that refers to a volcanic mountain with a rounded profile. After two Referrals in 2014 and 2016 respectively, France will try once again to get the Tectono-volcanic ensemble of the Chaîne des Puys and Limagne Fault enlisted – probably already next year. It’s a natural site that covers a string of 80 dormant volcanoes and a parallel geological structure to the west that shows inverted relief. When I prepared for this trip, I opted to visit the Gour de Tazenat – an almost perfectly round crater lake or “mare”. But when my rental car plans fell through, I had to find a way into the core zone of the Chaîne des Puys by public transport. Fortunately its main landmark, the Puy de Dôme, lies just 15km west of the city of Clermont-Ferrand and I was able to catch a shuttle bus between Clermont-Ferrand and the Dôme Railway Station on the last day of the season. The Puy de Dôme itself nowadays can only be accessed via the Panoramique des Dômes, a panoramic rack railway that covers the final km’s to the top. A return trip costs 12.30 EUR (in low season), though you can save a bit by riding up and walking down which supposedly takes some 50 minutes. At 10 a.m. I unfortunately found the Puy covered in the clouds. A temperature of -1 degrees Celsius was displayed at the departure station. Apparently it’s best to sit to the left in the train (for the better views), but it didn’t matter much this day as nothing was visible anyway. So what did I encounter at the top of the Puy de Dome? It was freezing cold indeed, the grass covered with hoarfrost. A strong wind was blowing as well, making any form of hiking a struggle. The clouds were so low that I could not see where to go from the upper train station. I just went uphill a bit more until I arrived at the ruins of the Temple of Mercury. This Roman temple was discovered when the scientific station at the top was constructed. They’re now trying to rebuild it – it is fairly large and it’s interesting to know that the Romans came to the top of this hill as well. The best thing on this day however was the adjoining exhibition room: clean, dry and warm. Beforehand I wondered whether 1 hour and 10 minutes at the top would be enough (as that was all I had to be back in time at Clermond-Ferrand Airport). Well, I even had time for a 30 minute break at the convenient cafeteria next to the upper station. Around it there are many panorama viewpoints, but on a cloudy day there’s just nothing to enjoy. So will it be third time lucky for the Chaine de Puys? Rarely have I read such negative reviews of a site by IUCN as these, and I guess they will continue to try preventing inscription. The Advisory Body’s opposition is based on two pillars: the high degree of human intervention and the comparatively low interest of the volcanic features on a global scale. The human intervention takes many forms, such as the antenna on top of the Puy de Dôme: “this entirely unnatural feature dominates the landscape and significantly and permanently detracts from its natural aesthetics”. Also active quarrying within the area must be stopped. France has twice succeeded in turning a "not to inscribe" recommendation by IUCN into a referral (in 2014 and 2016). Both IUCN evaluations were harsh, but clear, the main objection was that „the integrity of the property in relation to its natural values is compromised by the long standing and on-going impacts of human use, which result in a landscape that is fundamentally not 'natural'” (cited from the IUCN evaluation 2014). But now, on the third attempt in 2018, all concerns are miraculously dispelled and IUCN recommends inscription, thus a safe bet at the WHC. Two active quarries have been removed from the nominated area, but apart from that, the boundaries have not changed in comparison to 2014. Now the focus is on criterion viii (outstanding examples representing major stages of earth's history), criterion vii (superlative natural phenomena or areas of exceptional natural beauty and aesthetic importance) has been withdrawn. Apparently that was enough to convince IUCN. I visited the site in June 2013, it was the last step of a trip to Southern France. I have to say, I was surprised that it was nominated solely on basis of natural criteria. For a natural WHS it is a quite densely populated area. The human impact on the landscape is obvious: grazing sheep, active quarries, the huge antenna on the Puy de Dôme (already mentioned by Els), even a golf course. Well, there are more than 80 volcanoes (puys) in an area of about 30 km length and 4 km width, that is certainly impressive. 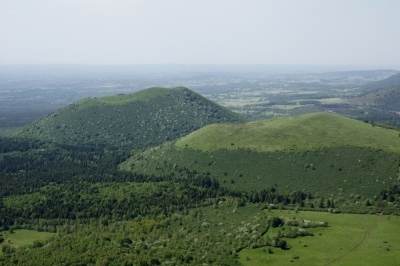 The "uniqueness of the Chaîne des Puys lies in the density of its volcanic features, and the varied chemistry of the lavas which result in visually distinct volcanic shapes: cones, domes and maars. The chemical differentiation is due to the location of magma chambers at different depths, in which different degrees of magmatic evolution took place” (cited from the candidature website). We thought we should start our visit at the Puy de Dôme. It is the highest peak of the area, and also one of the seventeen sites labelled as "Grand Sites de France". We arrived at 2 pm at the valley station of the rack railway. We had to share the train with a dozen tourists and about four or five school classes. At the summit, there were a lot more schoolchildren, obviously every French child must have been there once, and a considerable proportion of them chose the same day as we did. The weather was quite good, sunny, but not so clear that we could see the entire string of Puys. 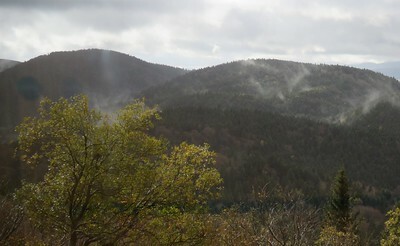 Nevertheless, the view to the surrounding volcanic cones was very nice (the photo shows the view to the Puy de Côme). But even if you enjoy extensively all the viewpoints along the circular walk and also take a look at the temple ruins, one hour on the top is enough. The next day we hiked around the craters near the Puy de Dôme. The trail goes from the Puy Pariou via the Grottes du Clierzou and the Puy de Clierzou to the Puy de Côme. We walked around the crater rims and to the bottom of the craters. There were only a few other hikers around but we saw a lot of grazing sheep. A nice half-day hike, but nothing outstanding. We had visited the highest volcanic dome (Puy de Dôme) and the highest volcanic cone (Puy de Côme) in the nominated area, so only a maar was missing. The description on the candidature website states that there are ten maars in the Chaîne des Puys, but it mentions only Narse d’Espinasse, which is actually a marsh filled with sediment. And it seems to be outside the core zone. Other sources often give Lac Pavin as an example, which also seems to be outside the nominated area (currently the candidature website and the map in IUCN evaluation show only one location). Apart from the Narse d'Espinasse we made two short stops at Lake Aydat and Lake Cassière, two dammed lakes (within the nominated area). Both "are the best examples of relief which has been modified through volcanism: the long lava flow originating from the Puy de la Vache sealed off two former valleys, thus blocking the water flow and leading to the creation of these two lakes" (candidature website). On our drive back to Clermont-Ferrand (where we stayed for two nights) we tried to spot the Limagne Fault, which extends in parallel to the Chaîne des Puys. Probably only people with some geological knowledge may recognize this as an important tectonic structure. By the way: the Basilica of Notre Dame du Port in Clermont-Ferrant is part of the WHS Routes of Santiago de Compostela in France. Well, I think I did my best to properly visit this tentative site. Because of the positive recommendation of IUCN, an inscription is very likely. One more tick on my list of visited sites. But, to be honest, I'm not very enthusiastic about the Chaine des Puys. I visited the Chaîne des Puys during a trip along the enchanting Dordogne. We drove up the highest peak of the chain, the Puy de Dôme. From there you have a fabulous view over the whole chain that is quite impressive. There are dozens of vulcanos of different shapes: domes, maars and cones like the wonderful Puy Pariou. They are not very tall volcanic formations but I have never seen so many in such a small area. Tectonic processes: Criterion (viii) Continental drift, manifested through plate tectonics, is an essential paradigm for the history of the Earth as it explains the current make-up of oceans and continents and their past and future movements. The property is an exceptional illustration of the phenomenon of continental break-up, or rifting, which is one of the five major stages of plate tectonics. Notable lakes: Gour de Tazenat: a volcanic crater formed by a phreatomagmatic eruption. Controversial at inscription: IUCN recommended Not to Inscribe in 2014 and 2016, both times brought back to a Referral by the WHC. At inscription in 2018, IUCN did give a positive recommendation for the substantially changed nomination - though "IUCN is deeply concerned about the manner in which the referral process has been used (and essentially misused) in the case of this nomination. The evaluation of this nomination has been lengthy, spanning five years and involving a disproportionate level of human and financial resources. IUCN has documented some 16 meetings and exchanges with the State Party and the World Heritage Centre between the 2014 referral, and then a further 11 meetings and exchanges between the 2016 referral decision and this resubmitted nomination"